Graded NM-MT 8 by PSA. Hall of Famer. For most collectors, the image that first comes to mind when they hear, "Frank Chance, Portrait," is the penetrating likeness seen on the offered card. 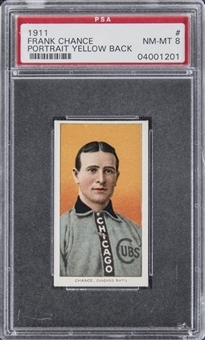 The player's features beam forth from the card's sublime yellow background with all the brilliance that the enthusiast has come to identify with a magnificent, uncirculated T206 White Border example. The effect is seen at its most pronounced level of glory on this offered card. Its colors are effusive and radiant, its borders reflect pure white and its corners are shaped to near-perfection. Oh, and one other detail. 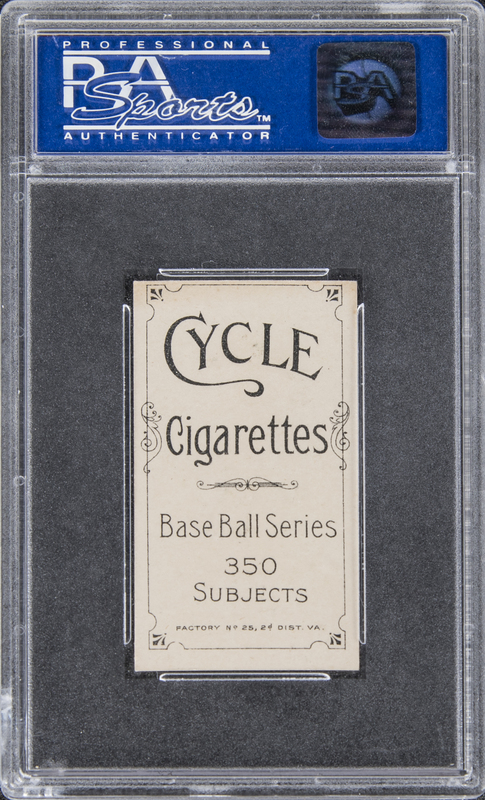 The admirer of this card is treated, from the back perspective, to the elegant sight of a rare "Cycle - 350 Subjects" advertisement. "Cycle" is comparable to the very tough "Hindu," and is almost never found with such extraordinary definition in its printing. A comparatively mundane "Piedmont" or "Sweet Caporal" reverse, of the sort we'd expect to find on the back of this item, would still be admirable when presented in the high-grade state afforded by the offered specimen. This remarkable Frank Chance card, with its unique combination of superb image, outstanding overall appearance and difficult back, is a potential trophy for one of the most advanced collections in the hobby. A beauty, in stellar Near Mint to Mint condition.